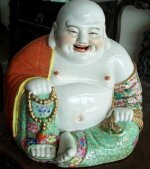 Budai, also called Laughing Buddha was a Chinese monk of the 10th century, a real person. He is always depicted with a big belly, laughing, sometimes with a sack, which he was always seen carrying around, according to legend. "Budai" means "sack of cloth" in Chinese. Due to his last words, uttered before entering Nirvana, many Chinese believe he was an incarnation of the Boddhisattva Maitreya. Over time he has become a symbol of a different kind to many non-Buddhist Chinese. Like Guanyin, which originally was depicting the Bodhisattva Avalokitesvara, but which is now also seen often in Daoist temples - as the goddess of mercy - the Laughing Buddha has also became a folkloric symbol of another type. He represents wealth and prosperity. The latter is the reason that figures of the Laughing Buddha often are seen on the front desk or counter of restaurants and shops in Asia.